Patterns for Ranch Trail, Showmanship, Equitation and Horsemanship, including the National Championship Semi Finals and Championship rounds. Also includes listings of AQHA patterns for Cow Horse, Reining, Ranch Riding, VRH, and Western Riding. The 2019 Pattern Book is available as a digital download. 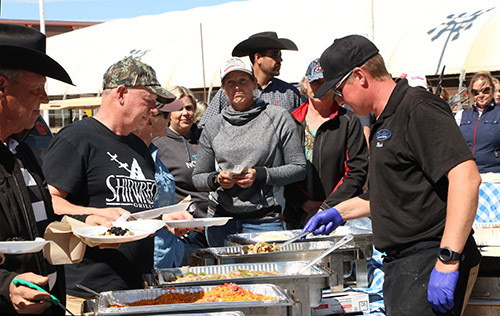 Get it now and get a jump on what to expect in Scottsdale! 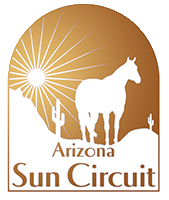 Proceeds from the sales of the Pattern Book support the AZ Quarter Horse Youth Association. Exhibitors please note that the patterns at Sun Circuit are all drawn to scale within a prescribed area. Exhibitors are encouraged to review the patterns prior to the show. 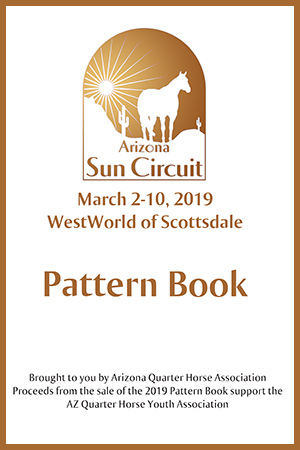 Sun Circuit Pattern books are available for a purchase price of $6. All proceeds from pattern book sales go to benefit the Arizona Quarter Horse Youth. Printed pattern books will be available for purchase at the show office also. Individual patterns will be posted the day prior to showing at no charge. 1. After Checkout, click the RED “2019 Pattern Book.pdf” button in the Downloads section. 2. File will be stored in your default downloads folder. The filename is “2019 Pattern Book.pdf” should you need to search for it. You can save the Pattern Book right to your device and have it with you at all times! 1. After Checkout click the RED “2019 Pattern Book.pdf” button in the Downloads section. 3. Tap the Share icon at the bottom of the screen. 4. Tap Add to Home Screen (in the second row of icons). This will place an icon on your screen allowing you to quickly access the Pattern Book with one click! You can also choose to email it to yourself, add a book mark or copy to iBooks. Note: Please do not share or republish your copy of the Pattern Book. This is a fundraiser for the AzQHA Youth. It would be very uncool to post your copy on Facebook and cut them out.